JCDecaux’s Airport division operates as a standalone division of JCDecaux, managing the advertising opportunities at Heathrow, Luton, Aberdeen, Glasgow and Edinburgh airports. They also manage advertising at Heathrow Express and at Eurostar terminals. And it’s at these locations that DOOH has seen some of the biggest transformations and investment in recent years. From a DOOH perspective, the turning point came five years ago when Terminal 5 at Heathrow was opened. For the first time in the UK, an airport had been designed with DOOH as integral part of the architecture. The digital screens were “built into the blueprint”, as Steve Cox, marketing director, puts it. The results are impressive, as the network of digital screens seamlessly tracks the customer’s journey through the airport. Rather than retrospectively finding the most convenient position for a digital screen, which works with the existing structure of the building, JCDecaux Airport were able to prescribe exactly where each screen should go in order to have maximum impact. Since the launch of Terminal 5, Cox estimates that the 800 digital screens operated by JCDecaux Airport account for 22% of their total revenue. On the surface this might seem as though the digital screens are not pulling their weight; JCDecaux also operate about 2000 static poster sites across their estate. But Airports are unlike other OOH environments, so the normal rules don’t apply. For certain brands, some of most prestigious static backlit sites (particularly at Heathrow) are simply a must have and they will invest appropriately to make sure they have ownership of the site for a long period of time. As Cox confirms, “A small minority of iconic airport panels contribute a disproportionate share of revenue”. To a certain extent, advertising space at Airports will always be popular, whether the poster sites are digitized or not. It’s the audience that the brands are really interested in: a captive audience of affluent travelers with a long dwell and a ‘spend-ready’ mindset. Cox sums up the Airport audience experience, “it’s a kind of mindset bubble…a world between worlds”. Assuming this is the case, why go digital at all? For Cox, it’s about wider choice for brands, “The thing with digital is that the reproduction for luxury brands looks fantastic but for a lot of the brands advertising at Airports they want stature and scale”, and it’s the large format, iconic backlit poster sites that offer this. With the exception of a handful of large digital screens at T5, the vast majority of JCDecaux’s digital estate is in the form of smaller format screens. But not for long. 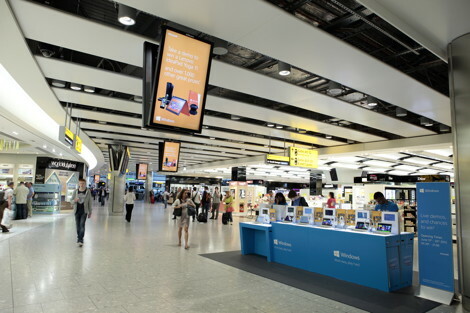 JCDecaux Airport recently unveiled the new advertising opportunities that will be available when Terminal 2 at Heathrow is re-opened following a major refurbishment. Like T5, the digital screens have been designed as part of the fabric of the building. ELEVEN iconic large format screens will be installed in positions where you once might have expected to see a backlit static poster site. This will offer brands all the benefits of digital, but with the stature and scale that comes with advertising on a huge site. Cox expects these new screens to be very popular, and despite T2 not opening until 2014, an auction process begins in November, which will sell media space on these screens on a long-term basis to the highest bidding brands. The strength of the Airport environment clearly has strong appeal to advertisers, but given the dwell time, ‘mindset bubble’ and space available at an Airport, DOOH is perfectly placed to deliver some of the most innovative ad campaigns. However, there haven’t been many campaigns of this type to date. As Cox confirms, “I think it’s fair to say that, along with the rest of the OOH industry, we haven’t done a lot of time sensitive and tactical campaigns”. Time sensitive campaigns have less relevance at an Airport, where travel patterns vary much more than commuter behaviour on domestic Rail services, for example. On the whole, it seems that advertisers tend to choose a simpler interaction with their audience at Airports. But a number of key brands, particularly tech brands, are trying new things and running tactical campaigns. 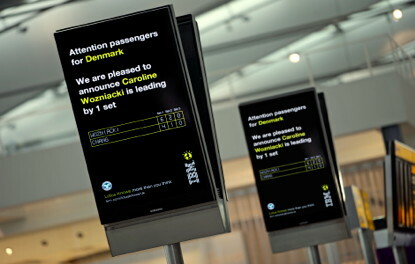 Probably the most celebrated Airport DOOH campaign in recent years was for IBM. As sponsors of Wimbledon, IBM used JCDecaux’s network of digital screens to display up-to-the-minute results and scores from the Wimbledon championships. The really clever bit was to link this information to the nationality of the departing flight, to ensure maximum relevance and cut-through. And it’s nationality-related campaigns that Cox would like to see more of in the future, especially as more digital screens are rolled out in Baggage Reclaim areas of the Airport, “for a flight arriving from Madrid, Spanish and English creative could be displayed on the relevant baggage carousel”. This type of idea can only be executed by digital formats. Another tech brand to use JCDecaux’s digital inventory in a non-standard way is Microsoft. They chose to use digital screens for the very reason posters were first put up; to direct people to a specific location. As with JCDecaux’s Rail environments, digital screens are increasingly becoming an integral part of Experiential activity, able to amplify the promotional activity and direct people to it. In fact, many of the quirky and interactive campaigns that take place at an Airport can usually be found in these Experiential zones, thus reducing the need for the wider screen inventory to be overly clever. For Cox, the single biggest change that he’s witnessed in his time with JCDecaux Airport is the improvement in creative standards, “[DOOH] is higher up on the agenda for big, blue-chip creative agencies and as a result they are more interested and working harder on creative [for DOOH campaigns]”. This doesn’t mean overly complicated, or innovative campaigns for the sake of it. Instead, it means high quality creative executions, ideally suited to the mindset of the passing audience. DOOH at airports is about go even higher up the agenda when T2 opens in 2014. When Heathrow’s Terminal 5 opened, it represented a major growth spurt for DOOH in airports (and the wider DOOH market too). Expect the unveiling of Terminal 2 to have a similar effect. The introduction of more large format digital sites will offer advertisers digital stature and scale, but perhaps more importantly the introduction of another digitized airport terminal will mean that JCDecaux Airport’s digital inventory will increasingly operate as a bigger, and more credible, digital network. And we all know that’s where DOOH’s growth as a medium truly lies. 1 Comment To "Steve Cox, Marketing Director, JCDecaux Airport UK"
I am intrigued exactly what research or data would JCD used to prescribe exactly where each screen would be placed for maximum impact. And what would that be exactly?